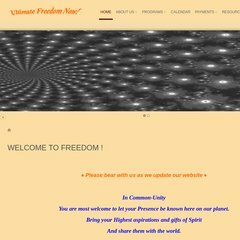 www.Ultimatefreedomnow.com - Welcome to Freedom ! Topics: Programs, Retreats, Payments, and Retreat Payments. Its local IP address is 173.236.175.134. Its 3 nameservers are ns3.dreamhost.com, ns1.dreamhost.com, and ns2.dreamhost.com. It is hosted by New Dream Network Llc (California, Brea,) using Apache web server. PING www. (173.236.175.134) 56(84) bytes of data.